Thanksgiving is a tradition that has been observed for the past 400 years. Typically celebrated on the fourth Thursday of November, the day has generally become a national secular holiday with religious origins. Thanksgiving Day, is a harvest festival. Traditionally, it is a time to give thanks for the harvest and express gratitude in general. It is a time to celebrate with the family and loved ones. In the United States, there are food that are traditionally served at Thanksgiving meals. First and foremost, baked or roasted turkey is usually the featured item on any Thanksgiving feast table. "Turkey Day" refers to Thanksgiving day. Stuffing, mashed potatoes with gravy, sweet potatoes, cranberry sauce, sweet corn, other fall vegetables, and pumpkin pie are common at Thanksgiving dinner. These primary dishes are native to the Americas or were introduced as a new food source to the Europeans when they arrived. Thanksgiving day also marks the start of the Holiday season. In line for the occasion, there is Sears Pre-Thanksgiving Sale currently on going. 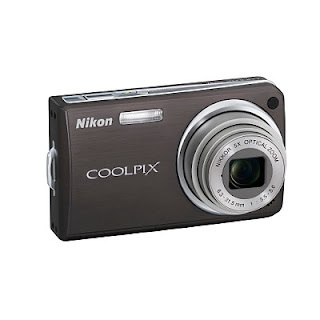 I browsed the site and found a digital camera that I like. It is now priced at $149 after the $50 discount. Wow! I just have to have this camera. Now! Better hop to the site for the big sale. zen ventures: thanks for the hop! happy thanksgiving too.